Pure Linen Retro Tea Towel, humourous illustration by Ulster Weavers. Pure Linen Retro Tea Towel, humourous illustration by Ulster Weavers. Finest quality large pure linen tea towel, featuring old fashioned retro advertisement. 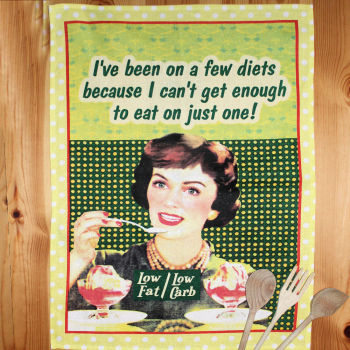 Great one liner that reads: Ive been on a few diets because I cant get enough to eat on just one! A retro style towel to brighten up most kitchens or breakfast bars. The material and print quality of these pure linen retro tea towels also makes them very collectable and could be a display piece, whilst collecting others from this range. Pure linen towels get better with age and use, providing increased softness and absorbancy over time and therefore are a fantastic useful gift.